Driving from the pier through the Turkish countryside along a hilly drive, you arrive at the House of Virgin Mary where the Blessed Virgin is reputed to have spent the last years of her life. The site was made famous by the travels of Pope Paul VI and Pope John Paul II. In November of 2006, Pope Benedictus the 16th paid an official visit to the House of the Virgin Mary. Outside is the Fountain of Our Lady, providing the faithful water from the holy foundation. Upon reaching the once powerful City of Ancient Ephesus and the Open Air Museum of today, the guided walking tour will include the highlights of Ancient Ephesus. You will return to the coaches through the Arcadian Way that still bears groove marks from ancient chariot wheels. At the Ephesus Archeological Museum, you'll be escorted through the 9 exhibits tracing the religious and chronological history of the ancient city. Filled with attractively displayed mosaics, statuary, and other artifacts, the museum exhibits several marble statues of the Mother Goddess Artemis, goddess of nature, childbirth, and the harvest. 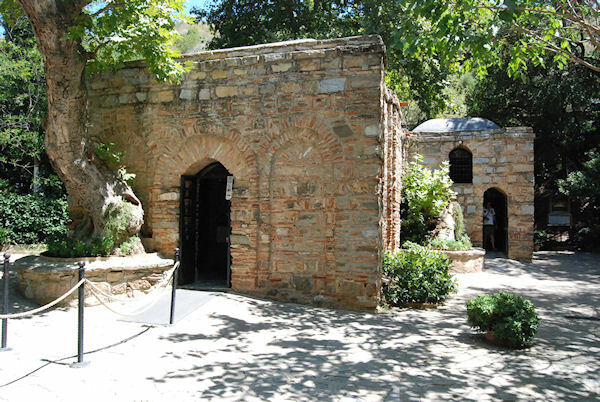 Combining the Information at the Open Air Museum and the Archeology Museum will give you a very fulfilling idea of the city of Ephesus and its importance in the ancient times. A tour voucher is required for children age 6 and older. No charge for children 5 and under. There might be time for browsing and shopping once back in Kusadasi. Excursions listed for a port may not be available for every cruise.